It's easier than you think to become an Olympic sensation. You can train for years, sacrifice hugely and perform to your highest ability in front of an audience of billions. But you can also just mention that you're on your period and become globally famous. This is what Fu Yuanhui, China's rather adorable swimmer, did when asked about her team's fourth place finish in the medley relay. "It's because my period came yesterday, so I felt particularly tired," she said. Because she is Fu Yuanhui and rather adorable, she finished the sentence by saying "this isn't an excuse, I still didn't swim well enough". It may not have been an excuse, but it was a disclosure that was revolutionary, because, stupidly, recognising that sportswomen have to perform even with menstrual cramps and while bleeding is still exceptional and newsworthy. Fu isn't the first sportswoman to admit that her uterus shedding its endometrial lining has impacted her job. Tennis player Heather Watson famously alluded to her period affecting her performance in the Australian Open last year. But she only implied, and the media inferred, that "girl things" meant bleeding. What Fu did was extraordinary. And how pathetic that that's the case, especially when new research done by Georgie Bruinvels and colleagues at University College London found that 37 per cent of elite athletes suffer heavy menstrual bleeding - about the same proportion as "regular" runners at last year's London Marathon - but despite the impact that anaemia can have on performance, only 22 per cent had sought medical advice. A recent survey by WaterAid found that 56 per cent of women in the UK avoid swimming during their period. Fu's statement is being called historic. Since most historical records were written or sung by men, we don't know much about how women managed their menstruation or how they were treated in the past. There are hints here and there in history that women's ability to bleed without injury was seen by male medical professionals as either mystical, marvellous or terrifying. Dr Read cites Lazare Rivière, author of a 17th-century anatomy guide, as saying that the womb was the source of "six hundred miseries and innumerable calamities". The Roman author Pliny thought menstrual blood was poisonous and could cause "wine to sour, trees and crops to die, mirrors to cloud, swords to blunt, and dogs to go mad should they chance to taste it". I've always wanted to blunt a sword and cloud a mirror. As for women who didn't bleed and were menopausal, they were often locked up. You think your period is just a pain, but given the amount of effort expended by men to keep bleeding women in their place, it's obviously a superpower. Daft menstrual taboos persist in certain countries and religions, where menstruating women have amazing power to make pickles go rotten , pollute temples, make snakes materialise or sour buffalo milk. But we have no grounds to feel superior in our supposedly enlightened societies. How many women and girls ask for time off work for menstrual cramps, or admit that that's why they are off sick? How many would admit to feeling appalling and weepy because of premenstrual tension? The only situation in which periods are talked about in the workplace is in banter and jokes, and that is not funny. But things are better now, right? Bodyform's recent ad Blood, showing women doing sport, fiercely, and bleeding to a soundtrack of thumping electronica, must mean that talking about periods and performance is now acceptable. This girl can, even when she bleeds. Except the only blood they don't show is the menstrual kind (I've no idea why, they refused an interview). All this positive period empowerment, and yet we're still being shown blue liquids in most period advertising and treating an athlete's statement of fact as a massive revelation. Athletes, who must know their bodies and abilities forensically and intimately, may well be the best women to loudly talk about periods. 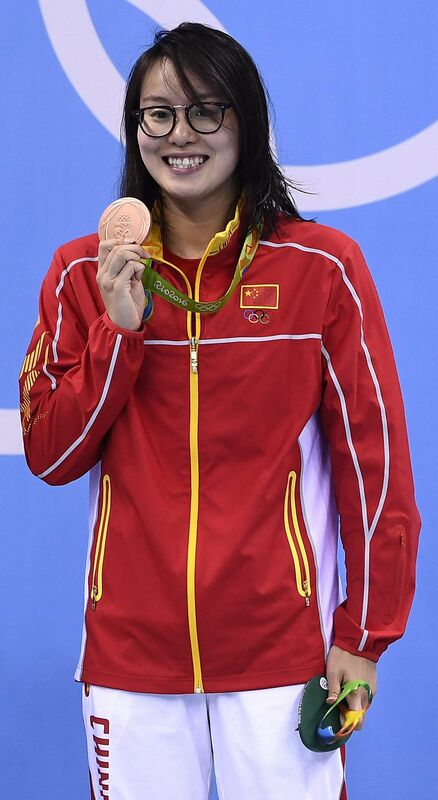 So Fu deserves her bronze in the 100m backstroke, but I'd give her a gold medal too: not for admitting that she had a period, but for conveying that it was no big deal. And now, women, let's get over ourselves and follow in her wake.